Armenian opposition leader Nikol Pashinyan speaks during a news conference in Yerevan, Armenia, April 24, 2018. The head of Armenia's opposition movement said Tuesday he is prepared to lead the country after Prime Minister Serzh Sarkisian resigned following nearly two weeks of protests against his rule. "Yes, of course we are ready to lead our country," Armenian National Congress leader Nikol Pashinyan said at a news conference in the capital of Yerevan. Pashinyan forced Sarkisian to step down Monday after leading protests that were triggered by accusations that Sarkisian manipulated the constitution to remain in power. Sarkisian served as president for a decade before attempting to extend his time as a national leader. 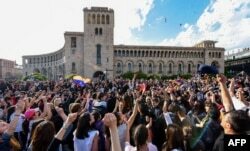 People celebrate Armenian prime minister Serzh Sarkisian's resignation in downtown Yerevan, April 23, 2018. Pashinyan led thousands on a march Tuesday to commemorate the anniversary of the Ottoman Turk massacres that claimed the lives of 1.5 million Armenians in 1915, signaling his political stature. Turkey denies the massacre of Armenians amounted to a state-orchestrated campaign. It instead argues that both Armenians and Turks were killed in intercommunal fighting amid the chaos of the collapse of the Ottoman Empire. Due to the solemn nature of the anniversary, politicians decided not to make political comments about the future of the former Soviet republic. Sarkisian's allies, including acting Prime Minister Karen Karapetyan, remain in important government positions and it is uncertain if his resignation will result in any significant change. Armenia's political parties in the legislature must nominate a new prime minister within seven days. Pashinyan is expected to play a key role in the possible reorganization of the country's politics.